Carol Harrison has been a professional photographer, taking images of individuals, artworks, events, and buildings in Washington, D.C., for nearly four decades. 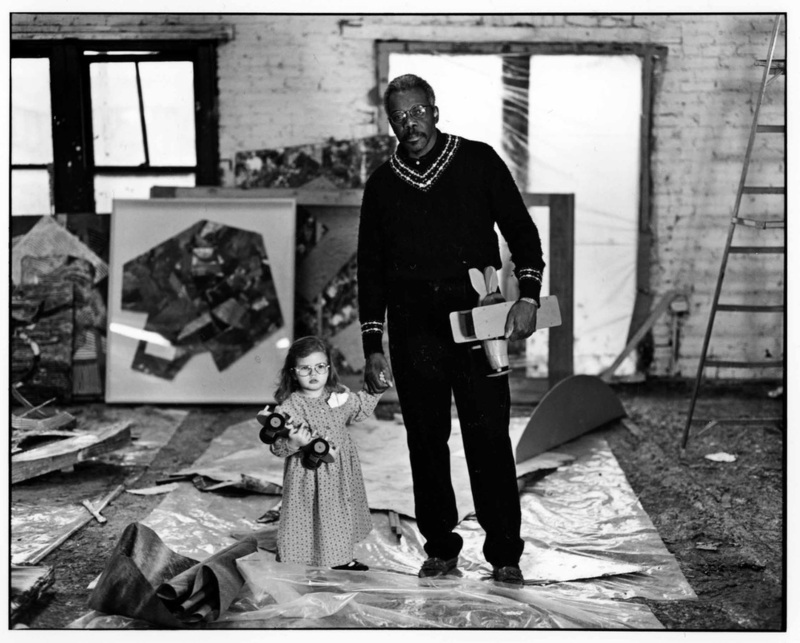 Through her work she developed a friendship with the artist Sam Gilliam, and over two decades took a series of portraits of Sam with her daughter, Olivia. Those images (one of which appears to the left) have been collected into a book, “Sam and Olivia: a fixed point in time from which a series of years is reckoned”. What follows is an interview between Robert Bettmann and photographer Carol Harrison. Robert Bettmann: Thank you for chatting with me about the Jefferson Place Gallery. That’s such a broad topic, and I know you had relationships with at least several of the artists involved. So lets start a lot narrower. Can you tell me about the day you took the photo of Olivia holding her truck and Sam’s hand? She looks likes she’s about two and a half years old there. It’s such a relaxed beautiful image. What were you all doing at the studio that day? It looks like he was preparing for a show? CH: Sam needed photos for a gallery, or a publication, I don’t remember which. And he gave his toys to Olivia to play with while I was shooting the photos. The train is actually his toy, not hers. Olivia liked to go to Sam’s studio ~ he was always very welcoming and dear with her. And Sam has 3 lovely daughters, who were occasionally there, so visiting Sam’s studio and talking with Sam and Steve was a normal and happy part of Olivia’s young life. Olivia called him “Uncle Sam”…. RB: How did the picture occur? CH: I was packing up my equipment, turned and saw them, and saw the photo! It was so perfect I had to steady my hands to focus the camera. It is one of my all time favorite photos of the millions that I have taken. Olivia was about 3 years old there. RB: How did you first meet Sam? CH: My friend Frances Fralin introduced me to Sam at his opening on a Saturday night at the Corcoran. The Corcoran Gallery of Art in the District was the focal point of our circle of friends in the 80’s. I was working hard, spending long hours in the darkroom, and relentlessly shooting portraits. I followed up on Frances’ lead and asked Sam: when may I photograph you? RB: What did you think of his artwork at that time? Did you give it much thought or did you have a more personal, peer-to-peer, relationship? Was he encouraging of you as a photographer? CH: I thought that Sam was a *ROCK STAR* artist! I loved his work before I even met him. And yes, Sam has always been very encouraging, supportive and appreciative of my work as a photographer. It was not a “peer-to-peer relationship” – I looked up to Sam and valued his direction as my MFA advisor, and still do. RB: When did you start photographing artists? CH: For my MFA, John Gossage assigned to me to photograph professional men for 2 years – 3 men a week in offices and businesses. John wanted to take me out of my comfort zone which is more: arranging to shoot at magical places like Dumbarton Oaks with beautiful natural light, and dressing everyone up. Another MFA advisor, Anne Truitt, suggested that I “return” to photographing individuals. So after my MFA, I was very tired of pin-stripe suits and fluorescent overhead lights, so I “returned” to photographing artists. It was fascinating to visit their studios, and see the work in progress. 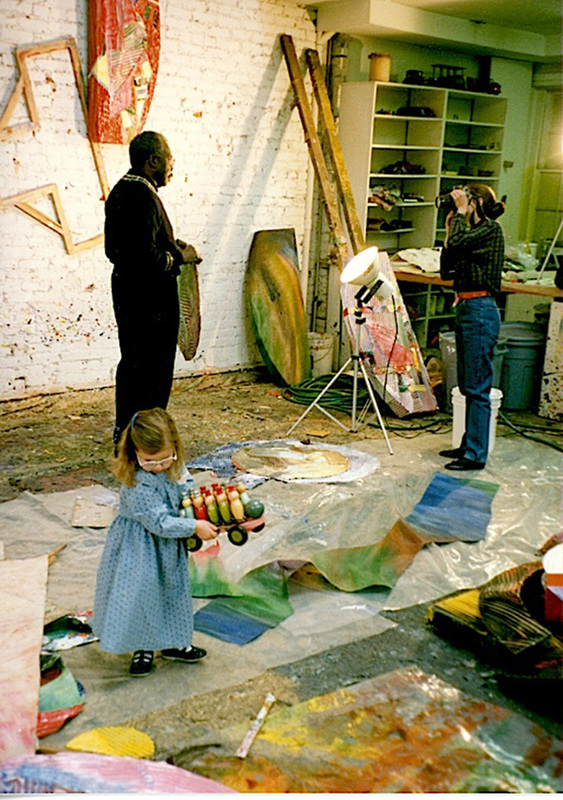 As a result of Ms. Truitt’s valuable suggestion, I have archives of photos of artists taken over decades. RB: I look forward to talking to you again. To be continued. For those interested in the Sam + Olivia series, check out the page on Carol Harrison’s website or preview the book here.